This is a hand-out created for a workshop at Lifestage, Inc in Sept. 2013 that is part of a monthly series on applied improvisation for the development of emotional intelligence. situations that could cause an amygdala hijack-and we train our brain to stay functioning at a higher level." Viv McWaters, "What To Do When You Don't Know What To Do"
Emotional Intelligence is associated with the ability to regulate and control the expression of emotions and validate one’s own thoughts and feelings. Self-regulation increases resilience to the stress response that could otherwise be triggered by the onset of a serious problem. Emotional Intelligence is the use of brain and mind to engage with the tensions of a complex situation rather than react to them. A 2002 study of over 200 UK retail managers found that individuals with high EI scores experienced less stress, had significantly better levels of health and well-being and were rated by their line managers as higher performers than those with moderate to low scores. Slaski, M., & Cartwright, S. (2002). Health performance and emotional intelligence: An exploratory study of retail managers. Stress and Health, 18, 63–68. "One of the most remarkable of all human skills is our ability to flexibly adapt to nearly every imaginable circumstance. This ability arises in part from our capacity to regulate emotions that are engendered by the situations we face. Drawing upon an array of emotion regulatory strategies, we can accentuate the positive, remain calm in the face of danger, or productively channel anger. One particularly powerful emotion regulation strategy involves changing the way we think in order to change the way we feel." Kevin N. Ochsner, James J.Gross,“Thinking makes it so:A social cognitive neuroscience approach to emotion regulation” K.Vohs and R. Baumeister(Eds. ), The Handbook of Self-Regulation (2003) Erlbaum, NJ. 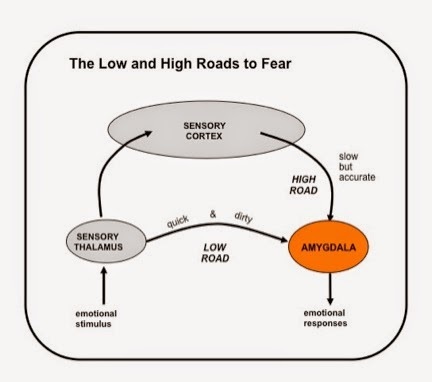 The amygdala is hard wired to be able to react quickly to danger signals and keep us safe. In modern days, its direct path to behavioral centers of the lower brain can cause issues with the amygdala being “hijacked” by emotional or psychological stimuli. Emotional intelligence grows through increasing the connections between emotions and higher cognitive functions - experiencing emotions consciously, labeling them cognitively and acting on them choicefully. Group stands in a circle. Group members step forward in response to questions, e.g. “Who here knows more than 5 people in the room?” “Who here knows more than 1 person in the room?” “Who drove more than an hour to be here?” “Who is left-handed?” “Who has a pet?” etc. Allow participants to share briefly about their response. Allow group members to come up with questions to find out more about other participants. Review the “hook” of musical themes from movies that most people recognize, including movies that feature heroes who do incredible things, e.g. : Mission Impossible, Theme from Superman, Theme from Rocky, Theme from Magnificent Seven; relationship or interpersonal issues: Theme From The Odd Couple; Sing each theme together to rehearse. Instruct participants to take 5 minutes to review something that have accomplished in their life that they did not think they could do. Identify: What was the goal? What were the obstacles? How does it feel to have accomplished this? Each participant can choose what theme music they would like the group to sing as they take center stage. Sing with energy to support the person as they take the stage. Everyone shares from 3-4 minutes. DEBRIEF: Reflect on the feelings that came up sharing the story with the group. The exercise is about facing and overcoming some degree of fear and anxiety, and some people will feel anxiety in real time about getting up in front of the group and sharing the story. 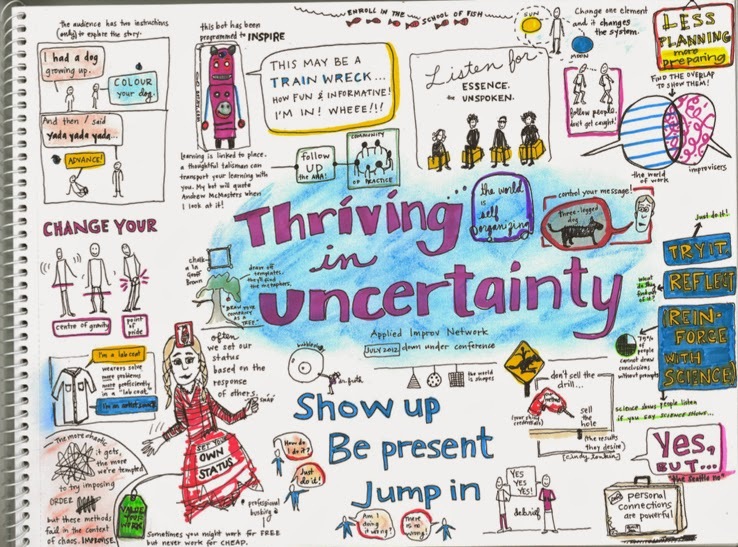 Experiencing the rise of anxiety and moving through it is central to the development of emotional intelligence, which deals with how we take responsibility for and manage emotional states. Discuss the effect of the group support through singing a “theme song” and responding to the story. A 2-person dialogue is read from the script titled "The Amygdala Hijacking." One character is a high-status person and the other a lower –status person (e.g. boss/employee) but in the first reading of the script the characters are identified only as a high-status and low-status person. After going through the script the group shares about what roles they felt these characters are in – e.g. is it a coach and an athlete? A parent and child? The scene is then redone in improvised fashion using all the different pairings. You want to tell me what happened to you in there? I do want to tell you. I do. So…what happened to you in there? I need an explanation. Neural static. Neural static? Is that what you said? Yes. My limbic brain circuitry was signaling anxiety. The anxiety made me all fogged out and I couldn’t think at all which signaled every more anxiety. So…neural static. Your limbic brain? That’s what you want to talk about right now. I just want to try to explain what happened out there. My prefrontal cortex was off line. Its as simple as that. As simple as that. Your prefrontal cortext was offline. Of course. Are you insane? When my prefrontal cortex is offline I am a little insane. So are you, when your amygdala gets triggered. Nobody comes in here talking about my amygdala. See you’re getting worked up. Your’re getting hijacked by your amygdala. Stop talking about my amygdala. It’s the alarm system in the brain. It hijacks the ability to think things through. Does that make sense to you? I think you’re trying to confuse me. The amygdala scans what we are experiencing and if anything about it is a “match” for something threatening that happened in the past, it sends out a frantic signal to react to the present in ways that we did in the past. By freezing up, like I did today. Or by gearing up for a fight, like you are right now. Yeah, your working memory is affected by how upset you are right now. My working memory is kind of busy thinking about…I see what you’re trying to do here. Your working memory – your capacity to pay attention and hold in your mind the facts that are essential for completing a given task or problem – is definitely impaired. So now you know. What happened to me in there. After the group has heard the dialogue with no specific roles attached to the 2 characters, read it again with the roles clearly defined by the group. Play with the emotions of each character as they go through the scene. Repeat as many times as the group wishes with different role relationships the group wants to assign. Put the script aside. Improvise the dialogue from the roles of high-low status. Create a completely new scene with clearly defined high-low status roles in which the high-status person is threatened by the behavior of the low-status person. Debriefing questions: Did playing with the dialogue help integrate the information? If not, what got in the way? If it did, clarify that according to the research, combining the cognitive, intellectual information with the emotional and creative dimensions of role-playing and character-building strengthens our ability to internalize new learning. A scripted scene can be used to provide information on any topic in this same way. 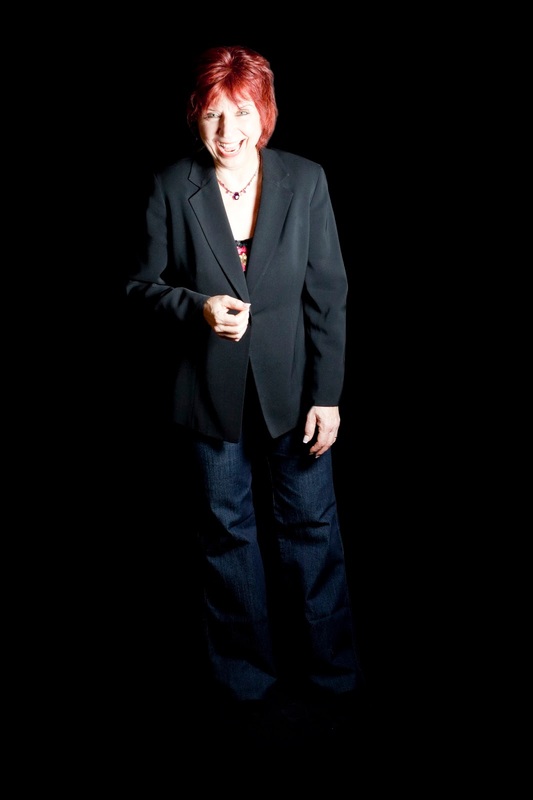 Jude Treder-Wolff, LCSW, RMT, CGP is a trainer/consultant and writer/performer. She is host and creator of (mostly) TRUE THINGS storytelling slam.